“Acha, yahan bhi constitutional amendments chal rahe hain,” observed a friend, scanning headlines in The Daily Star as we waited at Dhaka International Airport for a much-delayed flight to Karachi. Her comment about “constitutional amendments going on here also” highlighted something that’s always struck me as curious: the bizarre parallels of Bangladeshi politics with Pakistan, since Bangladesh gained independence from Pakistan in 1971. We’ve had prolonged periods of military rule and short-lived elected governments, the constant battle between those trying to conduct politics through religion and those struggling for democratic values, and now, as my friend commented, attempts to purge the constitution of amendments imposed by military dictators. 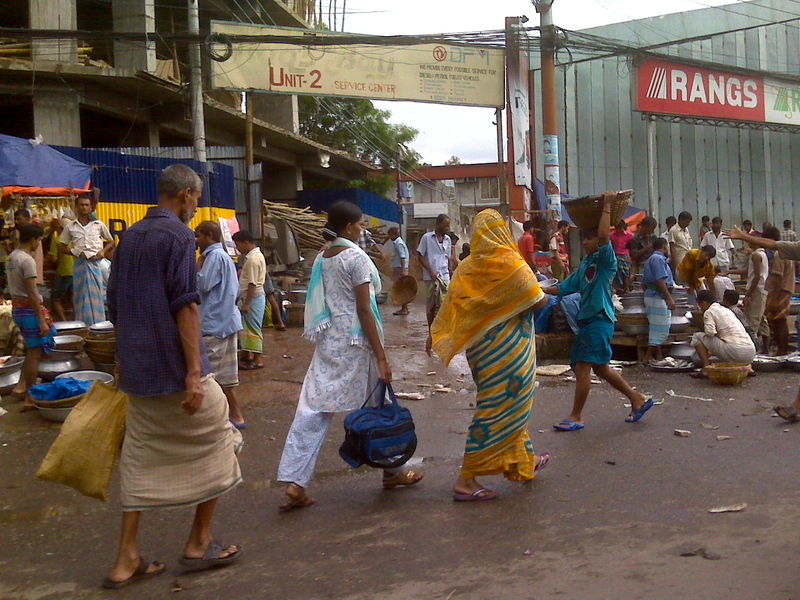 Passersby at a busy fish market in Dhaka. We’ve seen political assassinations of popular leaders Mujibur Rehman, killed by army officers in 1975, and Z.A. Bhutto, hanged by a military ruler in 1977; military coups by the Generals Zia (Ziaul Haq in Pakistan, 1977 and Gen. Ziaur Rehman in Bangladesh, 1981); spirited struggles for democracy led by the assassinated leaders’ daughters (Sheikh Hasina, Benazir Bhutto); and ‘train marches’ (in 1994 by opposition leaders (Nawaz Sharif in Pakistan and Sheikh Hasina in Bangladesh). A recent UNDP report on the Multidimensional Poverty Index (MPI) places Bangladesh at 73 out of 104 countries, one step better than India’s 74, and only shortly behind Pakistan’s overall 70. In education, Bangladesh scores better than India, Pakistan and Nepal. A whopping 89 percent of Bangladesh’s poor households’ children attend school. It’s the other way round in Pakistan. Bangladesh followed in Pakistan’s footsteps in making Friday the weekly holiday instead of Sunday (despite protests by the business community). However, it has not managed to reverse the decision, as Nawaz Sharif in Pakistan did when was Prime Minister. There was not a squeak out of the religious lobby when Sharif made this move (imagine the uproar if Benazir Bhutto had done it). But the weekly holiday issue is minor compared to the kind of laws enacted by dictators in Pakistan in the name of religion. Fortunately, so far Bangladesh has not capitulated to pressure from the religious right wing to declare Ahmedis as non-Muslims, or introduce the kind of blasphemy law that Gen. Zia pushed through in Pakistan. Sections 295-B (defiling the Holy Quran) and 295-C (defaming the Prophet Mohammed, peace be upon him) were added to the original Section 295 of the Pakistan Penal Code that dealt with penalties for outraging religious feelings. 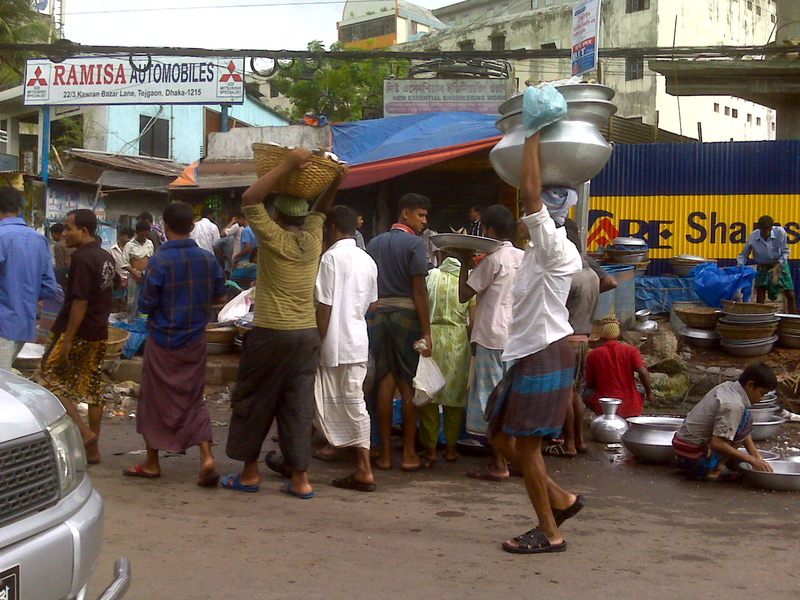 Since the addition of Sections B and C (that respectively prescribe life imprisonment and death for convicts) not only have these laws been used to settle scores but numerous alleged blasphemers have been killed – lynched by mobs, shot dead by zealots, on the streets, in police custody, in court premises. (In the most recent case, two Christian brothers were shot dead in Faisalabad as they were being produced in court for alleged blasphemy). As with the blasphemy laws that have led to widespread abuse, Bangladesh’s special laws against acid attacks have contributed, say lawyers, to a rise in acid attack cases (mostly on women) and to a new set of abuses such as the case of the man who threw acid on his own wife in order to frame someone he had a feud with, whom he then nominated in the first information report (FIR). Prevent muggings - lock yourself in! Both our governments claim to be democracies but continue to use undemocratic practices to crush political dissent or differences of opinion. The poor in both countries continue to barely eke out an existence for themselves. 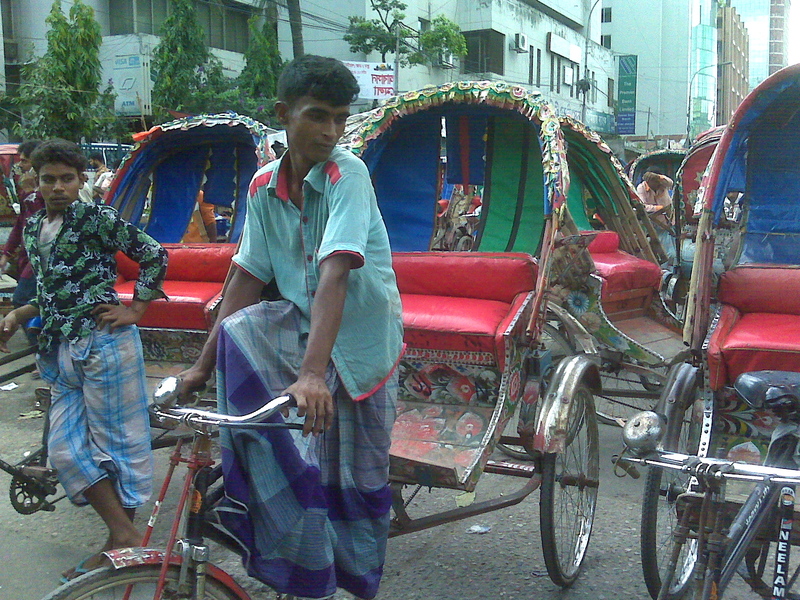 Many of Dhaka’s bustling streets are now off limits to the ubiquitous cycle rickshaw with its distinctive ‘rickshaw art’ that is akin to Pakistan’s ‘truck art’. However, they are still very much visible (policemen are known to puncture their tyres with nails attached to sticks if they cross their boundaries). 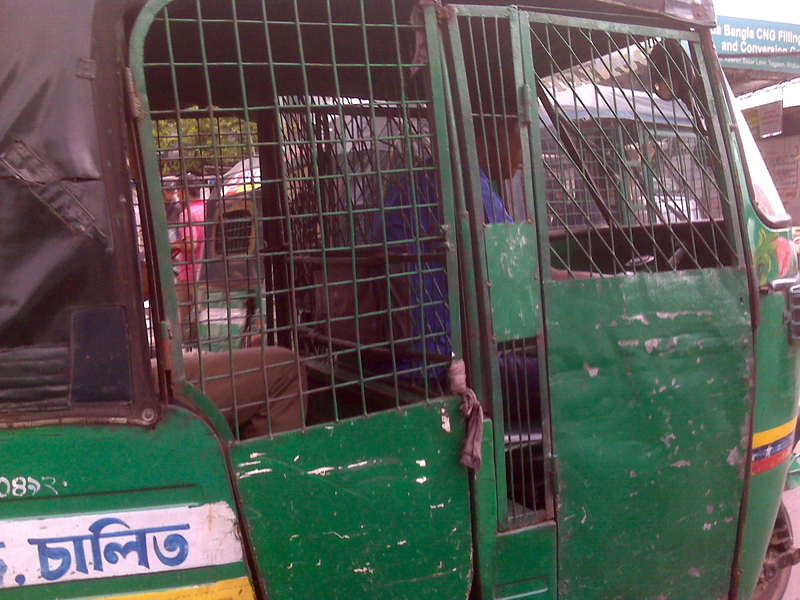 Intriguingly, the green CNG-powered auto rickhaws are protected by steel grills that serve as a protection against the muggings that frequently took place, we were told. As the PIA plane took off, soaring over the flat, verdant fields dotted by still bodies of water mirroring the monsoon skies, another parallel between our countries struck me: the remarkable resilience of our people who continue to fight on, and who will one day, prevail. Then we’ll hopefully have a more positive set of parallels to compare. nice post…Bangladesh is in a better position than Pakistan for sure. It’s the wrong policies of pak administrators that had taken the country where it is. The facts n figures that u hav used in this post is shocking….r u sure these r correct? Was it not the de-mockracy of Bhutto which made the earth-shaking 2nd Amendment reducing the Constitution to a Takfeeri Fatwa, which provided a handle to Zia’s dictatorship to give theocracy a free hand to impose theocratic despotism unparalleled in history?